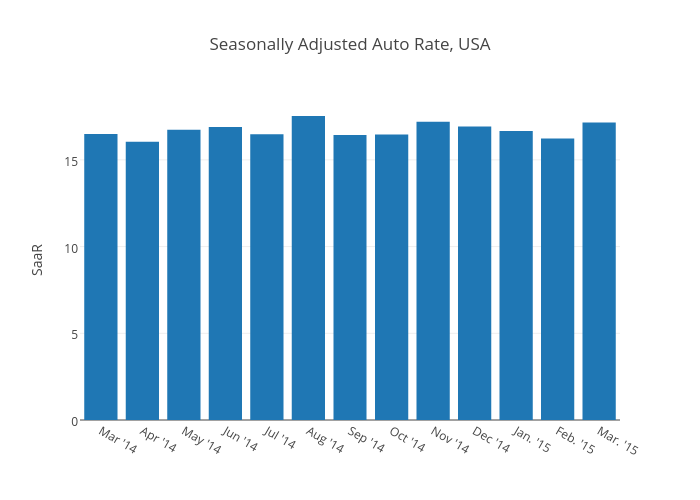 The latest results shows that the US is on track for more than 17.1 million cars sold in 2015, towards the high end, meanwhile Russia (-45%) is seeing a strong slowdown due to the sanctions. Ford is seeing this as an opportunity and has purchased a majority stake in their joint venture there. Manheim held its Used Vehicle Value Index call this week and showed that there is flat growth reflecting stability in wholesale pricing while certified pre-owned sales grew 11.4% year-over-year. Wholesale prices are expected to moderate given higher volumes while off-lease volumes are expected to grow in 2016-2018. Nissan will standardized auto braking along its platforms starting this year. Nissan will include automatic braking on all of its mass-volume vehicles by autumn of this year, starting with the hybrid X-Trail SUV. Autoliv believes take-rates for its night vision technology will increase from 80k/yr to 300k/yr in the next five years as autonomous technology becomes more prevalent. Bernstein Research looked into why Apple can make a car, it has been verified that they have hired 400 engineers to look into it, but to go from research to production is a long stretch. Bernstein listed five reasons why they feel Apple is poised to bring the car into their arsenal. Reason 1: The Auto Industry is a $1 Trillion Annual Market Apple is going to see a slowdown in growth from smartphones and tablets, they are well positioned to take on different fronts, with their deep pockets they can look at building a car. 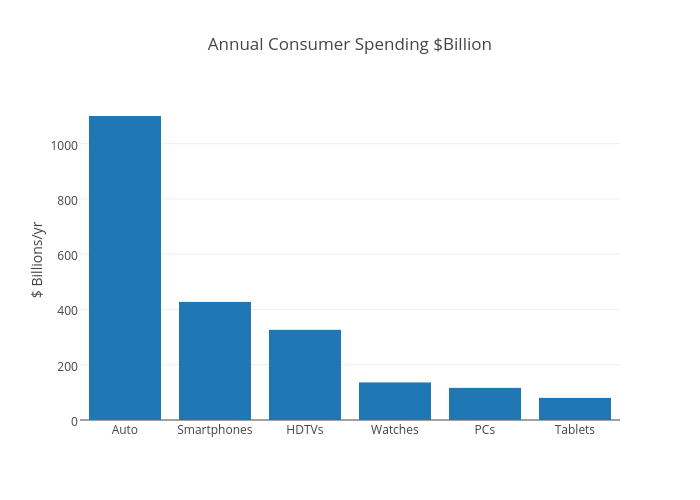 Consumers spend 2.5x more on vehicles than they do on smartphones annually and they are looking both upstream and downstream on the consumer spend. Apple’s focus has been on making premium, differentiated products and has taken on established competitors, many with deep R&D pockets. 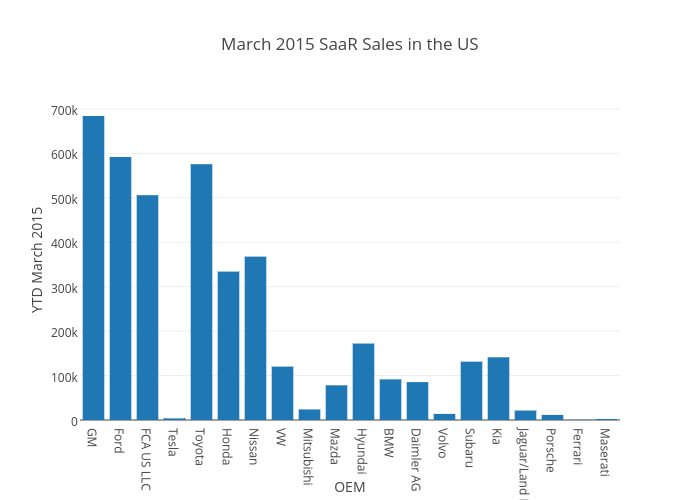 TSLA has upended the auto industry on a relatively shoestring budget. Note: [-] We feel that this is not enough of a reason, it took TSLA over 8 years to come out with their first vehicle, and they have a small percentage of the total market. Apple is going to become the interior supplier for the automotive sector. Apple has been able to charge a premium for long term and has sustained an advantage over its competitors in the past. Bernstein feels that they can replicate the same in the automotive space. 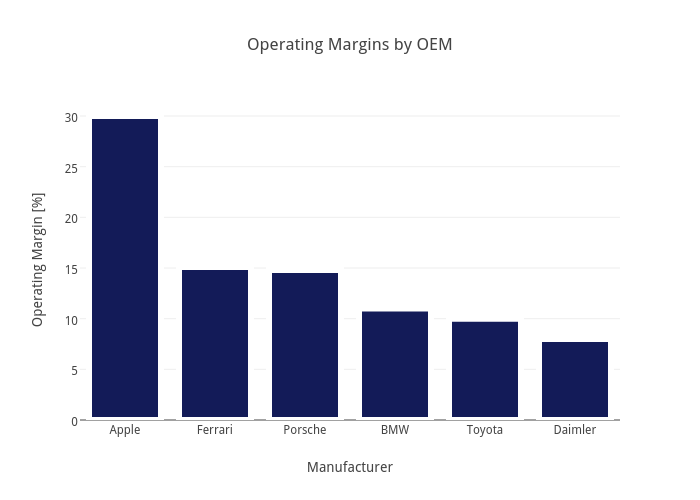 Bernstein maps out the Apple manufacturing layout vs. that of the Chinese automotive manufacturing space. Both overlay nicely. Although they can make a car in China, in terms of IP and cost savings of Apple making their first car and having to deal with suppliers in China and the US, we feel that if Apple manufactures the car it will be in Mexico or the US. Apple will be in the automotive space, but they will not be a big mover for the next two years. Look out for a prototype by 2017.